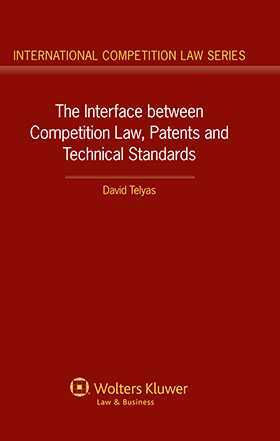 In The Interface between Competition Law, Patents and Technical Standards , David Teylas presents a systematic analysis of how competition law ensures that holders of technical standards (essential patents or SEPs) do not unduly exploit their advantage. The waging of “patent wars” is among the prominent features of today’s litigation landscape, with a single SEP being sufficient to block third parties from implementing the standard to which it relates and thus effectively excluding competitors from the market. The Interface between Competition Law, Patents and Technical Standards is a valuable guide to anyone working in this area of competition and patent law. David Teylas provides guidance to stakeholders, policymakers, and courts on how the current competition law regime applies to technical standards and where gaps exists, suggesting the most likely interpretation of the law. The book examines the different types of technical standards and explores how Articles 101 and 102 TFEU have been applied to prevent, identify and sanction patent related abuse. Included is an overview of the recent trends and developments in the field. In addition to drawing on all relevant EU competition laws and the Commission’s guidelines, the analysis extends when applicable to case law of EU Member States and to pertinent US sources, including literature, case law, and Federal Trade Commission documents. The Interface between Competition Law, Patents and Technical Standards is a valuable guide to anyone working in competition and patent law, providing a clear understanding of the legislation and remedies available. Chapter 6 What Is a Technical Standard? You may change or withdraw your consent at any time by contacting our Customer Service team at +1-301-698-7100 or [email protected]luwer.com. For more information about our privacy practices, please refer to our privacy statement: www.WoltersKluwerLR.com/privacy.